The X-ray laboratory contains four diffractometers: two Nonius Kappa-CCD Diffractometers and two Oxford Diffraction/Agilent SuperNovae A, giving access to both conventional molybdenum radiation and microfocus copper and molybdenum sources. All four instruments are fitted with Oxford Cryosystems Cryostreams enabling access to 80-500 K and there are seven microscopes covering a range of magnification for use with the diffractometers. 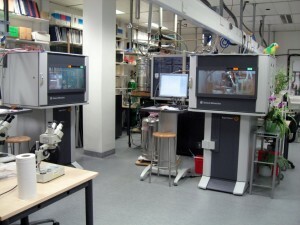 In addition the lab has hot and cold stage microscopy facilities with digital video cameras; a Thermo-Gravimetric Analyser (ambient-1,200 K) and a Differential Scanning Calorimeter (100-1000 K). In addition to the in-house instrumentation, the Departmental Service also has regular access to synchrotron radiation using I19 at Diamond Light Source through an award under the Block Allocation scheme. This enables determination of some of the most challenging structures which would not otherwise be possible.